What is love, and why are some people unable to find it? What is loneliness, and why does it hurt? What are relationships, and how and why do they work the way they do? Answering these questions, laying bare the heart's deepest secrets, is this book's aim. Since the dawn of our species, human beings in every time and place have contended with an unruly emotional core that behaves in unpredicted and confusing ways. Science has been unable to help them. The Western world's first physician, Hippocrates , proposed in 450 B.C. that emotions emanate from the brain. He was right to a degree and for the knowledge available -but for the next twenty-five hundred years, medicine could offer nothing further about the details of emotional life. Matters of the heart were matters only for the arts-literature, song, poetry, painting, sculpture, dance. Until now. In this book, the authors demonstrate that where intellect and emotion clash, the heart often has the greater wisdom. In a pleasing turnabout, science- Reason's right hand-is proving this so. The brain's ancient emotional architecture is not a bothersome animal encumbrance. Instead, it is nothing less than the key to our lives. We live immersed in unseen forces and silent messages that shape our destinies. As individuals and as a culture, our chance for happiness depends on our ability to decipher a hidden world that revolves-invisibly, improbably, inexorably-around love. Every book, if it is anything at all, is an argument: an articulate arrow of words, fledged and notched and newly anointed with sharpened stone, speeding through paragraphs to its shimmering target. This book-as it elucidates the shaping power of parental devotion, the biological reality of romance, the healing force of communal connection-argues for love. Turn the page, and the arrow is loosed. The heart it seeks is your own. Heart & emotions. OUR RECOMMENDATION TO ADVANCED STUDENTS OF RELATIONSHIP DEVELOPMENT. Carol & Rod thoroughly recommend this wonderful and mind expanding book to their advanced Counselling clients once they become curious to the capacity of and are prepared to open their mind to the possibility of changing the neural patterns of the brain. 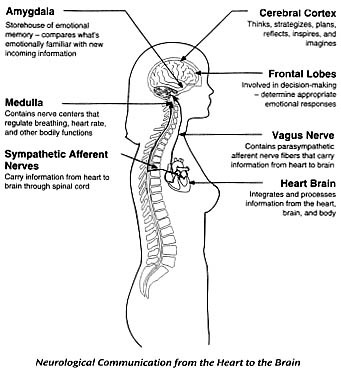 For further scientific connecting evidence to the Poly Vagal system and heart felt emotions, chemical stimuli. To Change the way you look at things so that the things you look at may change.